Being broadly used to manufacture, producers of cubitainers are accentuating on a wide range of features like anti-pressure and anti-drop, compatibility with several liquids, diverse size and shapes, capacity to fold, and enhanced toughness. Low-Density Polyethylene or LDPE cubitainers are picking up pace over the globe as it is a space effective and lightweight option. Moreover, its space saving factor are estimated to encourage cubitainers to fit in more stuff in transportation and warehouse. The cubitainers can be exceptionally personalized as well, as producers of cubitainers can adjust the size and state of cubitainers according to the necessity of the end use sector. Some of the major companies operating in the global cubitainers market are The Cary Company, Berlin Packaging, Zacros America, Changshun Plastic Co. Ltd, Thermo Fisher Scientific, Avantor Performance Materials, Inc., ChangZhou HengQi Plastic Co. Ltd, Changzhou Sanjie Plastic Products Co., Ltd, Quality Environmental Containers, and Cole-Parmer. 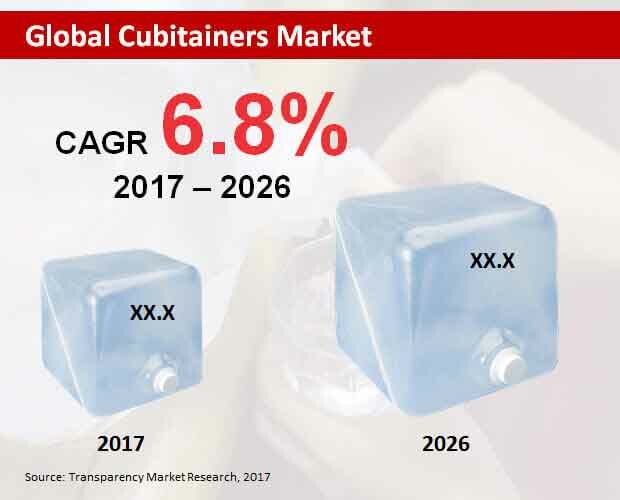 According to a recent report by Transparency Market Research (TMR), it has been foreseen that the global market for cubitainers is anticipated to witness sound development, growing at development rate of 6.8% CAGR over the forecast period from 2017 to 2026. The global cubitainers market is estimated to achieve a market valuation of around US$ 150.0 mn in terms of revenue by the end of 2026. Contrasted with the High Density Polyethylene or HDPE, the LDPE is foreseen to witness critical development within the forecast period. It is anticipated to produce the net revenue of more than US$100 mn by the end of 2026. Inferable from the different favorable circumstances, for example, minimal effort, and impact resistance LDPE is utilized on a big scale in the making of cubitainers. Geographically, Europe region is anticipated to emerge as the leading region all over the world, particularly in case of packaging serval liquids. Cubitainers are independent containers that are easy to handle and flexible enough. Coupled with its noteworthy performance, it likewise provides cost and natural advantages for storage, transport, stockpiling and administering of fluids. Cubitainer is experiencing a demand, on the back of factors like changing lifestyle pattern, food habits, eco-friendly nature and cost-effectiveness as it is recyclable and reusable. Rising number of producers and manufacturers that hail from different sectors settle on cubitainers as a powerful type of packaging device over different other popular packaging types as it isn't just ecofriendly as well as pocket friendly. This is one of the development advancing factor that is driving the development of the said market in Europe. Notwithstanding that, the demand for packed liquid food is taking off and hence it is additionally pushing the development of the cubitainers market in the mentioned region. Presence of key companies of cubitainers in the Europe region is as well contributing towards the development of cubitainers market in various European countries.